Last week I shared with you that we are FINALLY painting our kitchen cabinets white! Wahoo!!! I painted our peninsula awhile back using Rustoleum’s Cabinet Transformations in Pure White (minus the glaze) and that sort of sealed the deal for me. No more brown kitchen cabinets! I know how to paint furniture and cabinets and have studied the art of cabinet painting for a few years now. I wrote a post entitled Recommended Paint Tips for Painting Kitchen Cabinets which gives you top recommendations on the best paint sprayers, best primers, and best paints to use when painting cabinets. 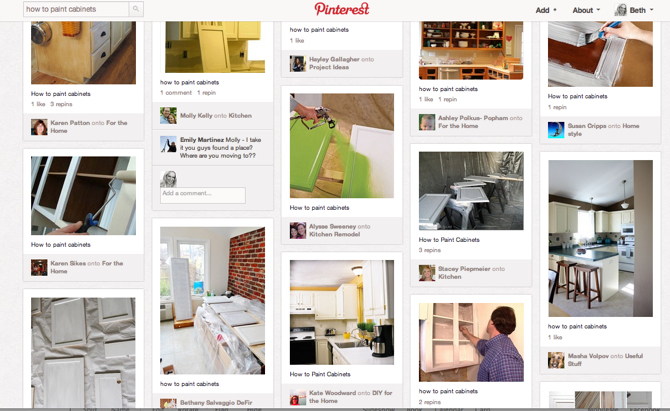 It also gives you links to several step-by-step posts on how to paint cabinets. If you need even MORE resources on how to paint your cabinets, there are no shortage of tips to be found on Pinterest. So…I’m a bit embarrassed to admit this but…. …Okay, no chocolate or ice cream bribes were involved, but I’m just going to come out and say it. I caved under the pressure and contracted the work out. I hired someone else to finish painting my kitchen cabinets. GASP! Blasphemy!! And you call yourself a DIY’er!!! Now that you’re all caught up on my latest confession, let’s see what DIY projects and tips you have to share with us this week! If you missed last week’s features, be sure to check out all of the best of the best on Tutes & Tips Not to Miss! I want to paint my kitchen white so badly! I couldn’t even imagine doing it myself though – I’d definitely pay someone! Thanks for hosting! 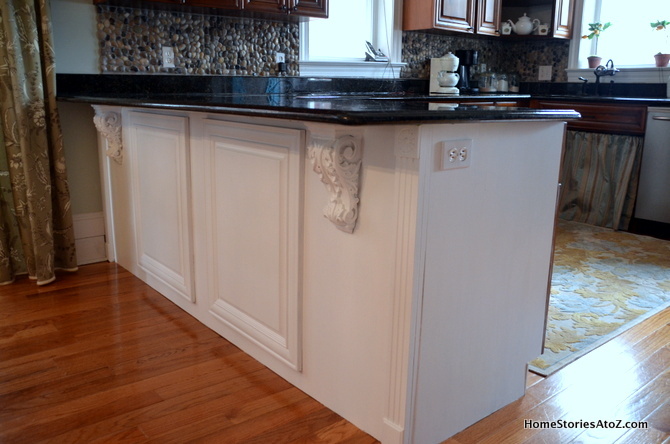 Your kitchen cabinets look so beautiful redone in white, Beth–very nice transformation! Thank you so much for hosting the party–so many clever ideas here. Do not be ashamed! We definitely have a lot of work in our future that we plan on hiring out! Sometimes the time (and risk of messing something up) are worth the extra money to bring in a professional! I love nothing more than taking on a project but your decision about the cabinets was 100% right. Time (esp with kids) is precious and jobs like that are overwhelming. Skilled tradespeople can do it faster and (sometimes) better. Money very well spent I say and I look forward to seeing the reveal! Thank you David! It feels weird to pay someone to do it for me but heavenly at the same time ;)! Thanks for hosting Beth! Hope you’re having a good week!!! Kassi @ Truly Lovely » Thanks for linking up! So true Mindy! Thanks for the reassurance :). Can’t wait to see your new kitchen! No shame in enjoying your blessings! Hey, girl! Your white kitchen is going to be fabulous. I’ve got white kitchens on the brain too & finally have something to link up. Woohooo, can’t wait to get my kitchen finished either. We’re going to be twinsies. Woohoo for being twinsies!! I can’t wait to see your kitchen reveal Rhoda! I don’t blame you one bit… thanks for hosting! Excited to see the white cabinets as I’ve been leaning toward white with mine for a few years. The island looks great by the way. Good Luck. Thanks John! I can’t wait for them to be finished. Wonderful! Look forward to reading it :). Smart decision! I’ve been there and done that and lets just say I will NEVER paint kitchen cabinets again! I value my marriage too much LOL! Looking forward to seeing more of your kitchen, Beth! I would paint mine in a heartbeat if we were staying in our house long term. I’m off to check out your previous post all about painting cabinets. Thank you for hosting! DIYer or not….there have been times I’ve hired out too, and when I do, I always think afterwards,……that was worth every cent! Thanks for hosting! Good for you for hiring out the painting! Obviously you are more than capable of doing it, since your peninsula turned out beautifully! Time is our most valuable commodity! Good for you! I’m a professional organizer who hires a housekeeper, I get the irony of hiring out what you should be an expert at doing for yourself. I wish more moms would choose the martyr-free route like you, because so many moms are frazzled thinking they have to do it all. And part of their reason for thinking they have to do it all, is they think others are doing it all. Maybe more of us should take your lead, confess we don’t choose to try to do it all ourselves, and take the pressure off of everyone. As someone who just spent 2 weeks painting her kitchen cabinets, I will say I don’t blame you! Although it is nice to have that extra money in my pocket! Thanks for much hosting us! I’m contracting our cabinet painting out too. I just can’t stand the thought of all that work and *potentially* messing them up! There’s NO shame in hiring out if that’s what right for you, although I can relate to feeling a little sheepish about it. We considered DIYing the exterior paint job of our brick townhouse for about 3 seconds before we realized it was an awful idea for us. It took a while to get used to the idea of actually paying someone else to do it, but it sure felt GLORIOUS to have the job done quickly, professionally, and with no effort from me 🙂 Thanks for hosting and congrats on the cabinets! Thanks so much for hosting! The cabinets look great and paying for help can be a very good thing when it frees so many hours of your time. Cracking me up over here with the klondike bar 🙂 White Dove is what I painted the planks in our family room….it’s a great white! Thanks for hosting. I love, love, love your kitchen! aw it’s OK! Enjoy spending time with your boys & don’t feel guilty! 🙂 They are going to look FABULOUS and I can’t wait to see the big reveal!! Thank you for hosting, Beth! Don’t you feel guilty one bit–enjoying that time with your kids is way more important! I’ve been doing a LOT of thinking about how I’m spending my “blogging time” vs. special time with my girls…. Can’t wait to see the final reveal of your dream kitchen! There is no shame in hiring someone to do something like that. I would have done the same thing! Your kitchen is going to be gorgeous. Thanks so much for hosting this party. Hope you have a great week! I have hired out painting too – I love doing furniture projects but big rooms and big jobs are no fun. If you find someone you like and the price is right – no shame in hiring that paint job done! Can’t wait to see the rest of your kitchen transformation – and thanks for the great party! I can’t wait to see how your kitchen cabinets turn out. No shame in hiring someone to paint them. I’d hire someone to paint mine if I could. I can’t wait to see your new white kitchen! Woo hooo! Thanks for hosting! I linked up my faux beam post. 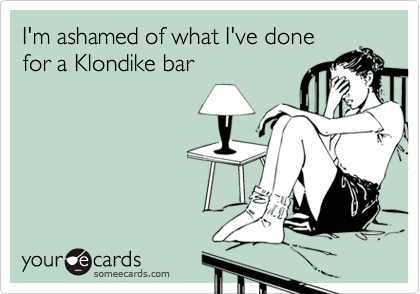 that klondike bar meme is hysterical thanks for the party!